When it seems that all is lost and Gotham will perish under the chaos of its infamous villains, simply pour hot liquid into this mug to see that Gotham's justice has a new name, Batman! 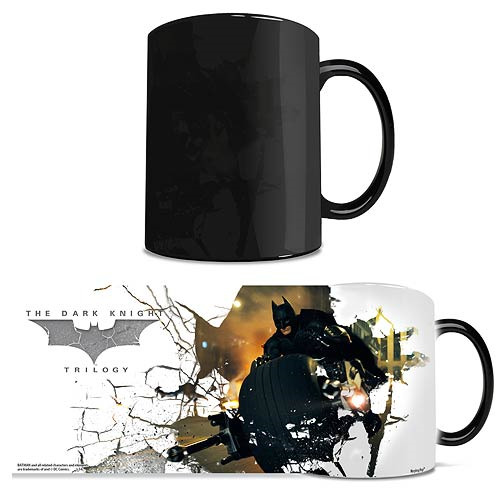 Now you can recall the acclaimed Christopher Nolan Dark Knight trilogy with this amazing character Morphing Mug! This 11oz Morphing Mug transforms from black as hot liquid is added! Watch as the heat-activated process reveals the hidden image in full vivid colors! Color Changing Ceramic Mug. Heat-activation reveals hidden image. There are a lot of characters in Gotham... Who are you?